Supersize your fun with giant games hire for your event, party or wedding. A great idea for entertaining guests before dinner or between activities. Giant outdoor games such as chess, jenga or connect four can be hired for events across the UK. Garden Games: Connect 4, Jenga, Snakes n Ladders, Tower of Hanoi, Quoits, Croquet, Skittles, Dominoes, Adult Space Hoppers, Table Top Football. Giant garden games available - chess, draughts, Jenga, connect 4, dominoes, noughts and crosses. Our garden games are great fun at any event with our most popular one being giant tower blocks. They are a great all round family games. 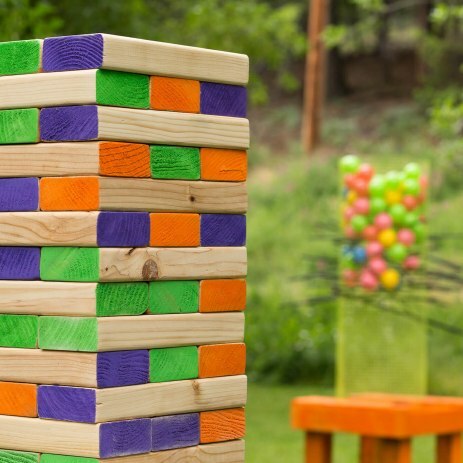 We supply games for all ages - we have giant jenga, giant connect 4, limbo, quoits, skittles and roll-a-ball available to hire. Suitable for indoor or outdoor use and ideal for children's parties! Take your pick.... Our giant games package includes connect 4 , target arrows, boules, croquet, dominoes and tower blocks (Jenga ). Add some old school fun to your celebrations with traditional board games in giant form. Giant snakes and ladders, life-size pick-up sticks or oversized playing cards are all giant games that can be hired to keep guests entertained. Giant garden games can be placed on the lawn or played inside if there is space. Show your guests you’ve thought of everything and make sure they’re having a great time, all the time. To find out what giant games are available to hire, take a look at some of our giant game suppliers. Once you’re ready to find out more simply complete a free quote request form and wait to hear back from suppliers in your area.